Working my bum off! Gosh I sort of got used to the slower months of November and December. It was nice, weird, but nice. Crocheting was done, tea was had, snuggles were accomplished. I easily settled into the nice slower times. But then January! Oh January! Day one- January 1st- BAM order after order. Don't get me wrong- it's nice to have such Etsy lovin', but sheesh it sure rocked me wide awake. I haven't stopped pumping out edible decorations since! Thank you to all my loyal, loving, and supportive customers! You guys rock. Rock!!! 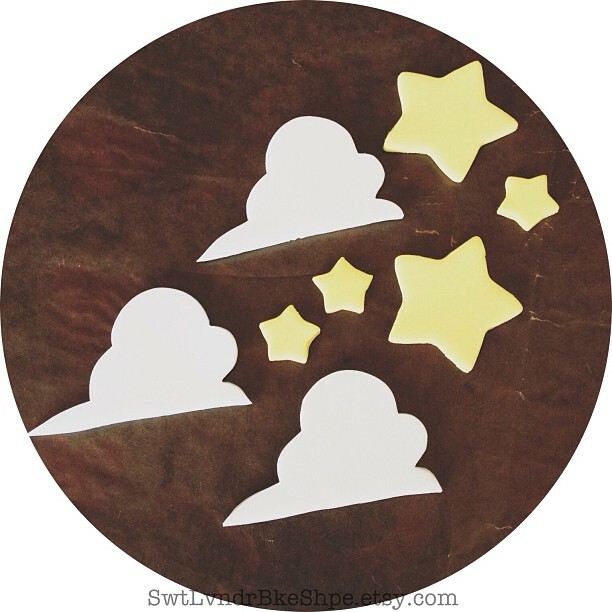 I just adored this latest order- a combination of fluffy white clouds and bright yellow stars. Those stars will soon be gently brushed with edible glitter- which might be my favorite thing to do. Edible....glitter? It's basically the neatest thing ever. Welp, that's it for me! I seriously need to get my self back to work, stat. Catch you on the flip-side (whatever that means). PS- Clouds can be found here and stars here.